The bagpipes exist in many forms and traditionally have been found extensively in Ireland, Russia, Finland, Germany, France, Spain, Portugal and Egypt. In each country the basic instrument is the same, a bag with a chanter and possibly one or more drones. Some are mouth blown while other use a bellows attachment to supply the air. There is little doubt that nowhere has the bagpipe been received with such enthusiasm as Scotland. The Great Highland bagpipes are synonymous with Scotland. When you think of Scotland, you think of Bagpipes. 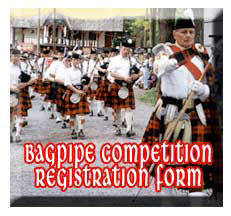 The Gulf Coast Celtic Fling & Highland Games are currently holding registration for its 2005 Bagpipe Competitions. If you or anyone you know is interested in competing please "click" the icon below. For more information contact scottisharts@aol.com. Competitors may enter only one grade, class or section. All competitors must obtain competition numbers at the registration table. 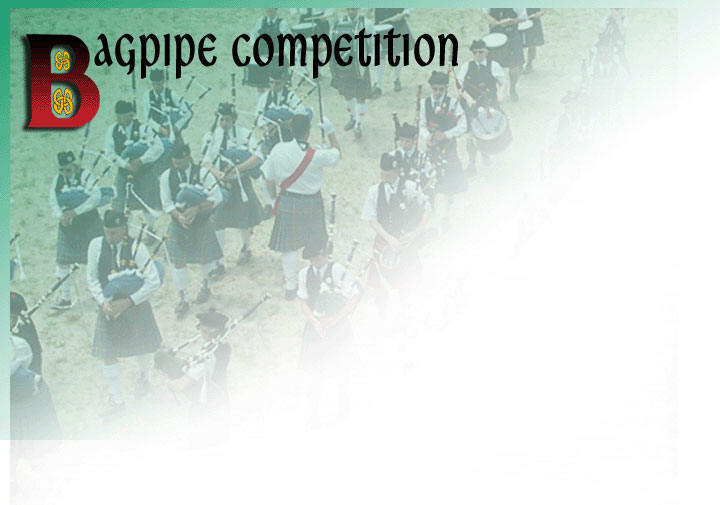 Times of play for all individual piping and drumming events will be posted at 8:30 am. Competition will begin at promptly 9:00 am. ANY COMPETITOR NOT PRESENT WHEN NUMBER IS CALLED WILL BE DISQUALIFIED UNLESS PRIOR ARRANGEMENTS HAVE BEEN MADE WITH THE EVENTS COORDINATOR BEFORE COMPETITION BEGINS. NO INDIVIDUAL ENTRIES WILL BE PERMITTED ON THE DAY OF THE GAMES. Band Registration fee will be $50.00 (Non-Refundable). Entries must be postmarked on or before February 1, 2005. Each band will be issued three vehicle passes for on-field parking. The first 16 bands registered will be eligible to receive travel allowance based on the distance to the games in Bradenton, Florida.. Determination will be based on the 16 earliest postmarks. To qualify for travel allowances, bands MUST compete and participate in opening and closing Massed Bands performances and any additional performance as requested in full uniform. Travel allowances will be paid regard-less of whether or not the band wins a prize. following the draw. A member of each band is required to attend this meeting. All bands will be required to play and perform on field as needed and play in both Massed Bands. THERE MUST BE TWO OR MORE BANDS TO HOLD COMPETITION IN EACH EVENT. D12—Tenor Amateur a 4 parted March in 2/4,4/4, or 6/8 time..
1st $300. 2nd $250. 3rd $200. CLICK HERE to submit the members names in quartet.